As you know, I adore entertaining, and when we host loved ones, I often reminisce about our very first dinner party (ah, memories!). We had just moved into our home, and I remember spending the entire day preparing for the occasion, from scrambling through the market in search of exotic ingredients to dashing to Neiman’s at the last-minute for extra placemats. Since then, I’ve learned a tremendous amount about entertaining – most importantly that the hostess needs to be relaxed and have fun! – and so I’m thrilled to share my MBB-approved tips with you dear readers. Whether you’re hosting a sensational gathering this weekend or simply dreaming of future dinner parties, here are my top tips for entertaining. Enjoy! Food: Before you whip out your spatula, check with your guests to see if they have any dietary restrictions and/or allergies so you can tailor the meal accordingly. Next, plan your menu – my go-to is always Barefoot Contessa! – and strive to serve dishes that you’ve prepared before (or at least do a test-run) so you’re not fretting over a strawberry soufflé that doesn’t quite resemble the image in the cookbook. Also, I love to serve an appetizer/and or starter, entrée, and dessert as it makes for a lovely flow of courses. Cocktails: Stock your bar ahead of time with both alcoholic and non-alcoholic libations that will please the palates of all your guests. In addition to the wine or cocktails that are served, be sure to have glasses of refreshing water on the table. Atmosphere: Create captivating ambiance by beautifully setting the table (Juliska dinnerware and linens are my favorite), and arranging gorgeous florals for the house. Also, consider flicking candles for the table and rooms where you’ll be entertaining, as well as turning on soft background music. Finally, make sure the powder room is guest-ready and the house is sparkling clean! Details: If you’re having a large group, consider using precious place cards so guests can easily find their seat. Other delicious details to keep in mind are printing out menus for each place setting (I just love this idea!) as well as little party favors, such as homemade truffles wrapped in cello with a bow. Planning/timing: So you can be cool as a cucumber, make a timeline two-three weeks prior to the event, outlining what you need (i.e., any extra serving pieces, party supplies, etc. 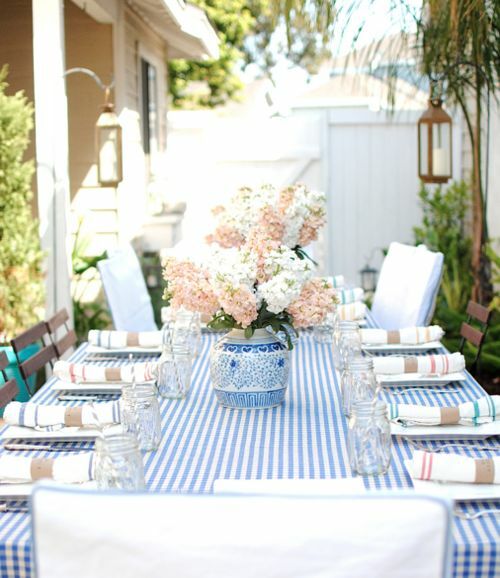 ), when you’ll set the table, when you’ll prepare the food, arrange the florals, etc. Also, aim to time the food so it is ready or near completion when the guests arrive (perhaps the meal is finished, you just need to toss the salad or plate the entrée that is warming in the oven), and have the appetizers and drinks out. Additionally, stock up on decorative cocktail napkins, be it paper or monogrammed linen ones. Have fun! : Last but not least, instead of stressing about every little detail or mishap, focus on being relaxed. Entertaining is about gathering with family and friends and enjoying each other’s company and a delicious meal you (or the caterer!) has so lovingly prepared – so have fun!